Thank you, President Bunch for that kind introduction. More important, congratulations to you and Mid-State College for celebrating 125 years of service to our community and your sponsorship today. Education powers innovation and Mid-State’s commitment to our community demonstrates this positive energy every day. Federal is grateful to join you in the Century Club this year. Thank you to Brent and the Chamber of Commerce for inviting me to speak today. I’m very proud of the incredible work that the Chamber of Commerce accomplishes each day as it focuses on being the leading voice for business in the region. With over 7500 businesses in the SMSA, from less than 20 employees to greater than 500 employees, our Chamber of Commerce leads with knowledge and professionalism. On behalf of The Federal Companies, Paula and I wish each of you a very Blessed Thanksgiving. As a community, we have much to be thankful for this year and “we have miles to go before we sleep,” using the words of Robert Frost. Most important, we are thankful for a community that is continually growing and striving for improvement; never resting until the needs of the people are met with care and dignity. We care deeply about our fellow man and neighbor whether nature shows her fury in the Philippines half way around the world or in our next door neighbors back yard as witnessed this last week end. Our community rests only when the humanitarian needs have been completely assisted. We thank our First Responders, American Red Cross, United Way and clergy for beginning this healing process. We care very much; none of us will rest or stop giving until we heal our community. We give thanks today to our elected leaders, teachers, police officers and fire fighters. Despite our challenges, our growth in 2013 was nonstop and this short list is only intended to provide a glimpse as to the power of our people. We celebrated the one year anniversaries for our new Peoria Riverfront Museum and Cat Visitor Center. We just celebrated an incredible multimillion dollar renovation of RLI. We celebrated a long awaited opening of the Pere Marquette renovation and are watching the construction of the parking deck, the gateway to the convention center, and the beautiful court yard hotel. We have witnessed incredible growth in our medical community leaders, the completion and opening of the Jump Trading Simulation and Education Center, the continued outstanding growth of our Peoria School of Medicine, the continued expansion of OSF and their regional services, the Children’s Hospital growth and the merger of Unity Point Methodist and Proctor. Wildlife Prairie Park now belongs, again, to our community - amongst many other wonderful accomplishments. But our community is not resting on its laurels as business and government leaders discuss and plan Downtown Development; further expansion of the warehouse district; investment in education in District 150, Bradley, Mid-State College and ICC; and regional economic development strategy through FFCI. In preparing today’s remarks, I looked to history to guide my thoughts. With Federal and Mid-State College being in Peoria for a combined 225 years, we are grateful for the leaders that came before us and the opportunity to celebrate as a community. Thanksgiving has two parts: Thanks and Giving. We give thanks to the early Pilgrims seeking a New Colony. They endured a harsh winter and in early autumn 1621, the 53 surviving Pilgrims celebrated their successful harvest with local native Indian tribes. We give thanks to this early practice of inclusion. We give thanks today to the veterans and current active duty members with us today and to those serving overseas. We bow our heads for those who paid the ultimate sacrifice. These men and women serve so loyally for this country to keep us free from the persecutions, the human injustice and the economic chaos that drove the early colonists and Pilgrims to seek our shores. We give thanks for our community leaders since departed. We pause and silently remember the great deeds of Jim Maloof, Pete Vonachen, Gary Sandberg and Don Ullman, amongst others. We celebrate their achievements in business, stewardship, and community giving. And as a business man, we give thanks today to Free Enterprise and the lessons that may be learned from our families. On a personal side, as a young man starting life in Yuma, Arizona, and then moving to West Texas in the early 60’s, I learned early from my parents their CORE Values. My parents built their relationships upon trust, face-to-face communication, and finding the merit in every person. My dad especially loved people and people loved him; he met no stranger. My dad was a true entrepreneur and had many businesses from insurance, to auto sales, to retail in a small town in west Texas on the local square where we spent many hours helping them with the business. Fortunately in the state of Texas you could get your driver’s license when you were 14 and a commercial license when you were 15. I got both licenses and started driving – as you may guess, household goods and freight. At 15, I was now learning a business that I could use the rest of my life - 47 years and counting. No one kept me from getting a summer job; no one limited my ability to learn the skills of the over the road driver or the transportation industry; no one told me I was too young. The best friend I had was OJT (On the Job Training) and free enterprise. And make no mistake, there are days I might wish I were still driving. This year Federal celebrates 100 years as a small business in Peoria, Illinois. We joined the Chamber of Commerce in 1922. We give thanks for the opportunity to be of service. I want to reflect a minute on the power of small business in a community and the vitality that business brings to the region. Businesses, large and small, begin their roots in the town square shops of our small towns, as the small town which housed my parent’s store. Businesses start New Colonies. The warehouse district and downtown development, partnered with rebuilding Washington and Tazewell County, are today’s New Colony. I am sure in 1913 the thing that Clarence Ullman, the founder of Federal, thought about that first day was “Not how do I make this company survive 100 years?” His first thought was, “How will I survive today, tomorrow, and grow? – our own daily thoughts. The businesses with long legacies in this wonderful community rest on the strength of people, changeable instincts, differentiation, and our leadership that gives back with humility and appreciation. Turning back to the key component of giving thanks, this community is thankful for all of our local businesses, many competing on a global scale. And, to each of our business, we are thankful for the investments made, the investments potentially to come and the commitment to rebuild. Most importantly, we give thanks today for the opportunity to reflect upon our gifts and know that we as a community can only survive if we lock arm and arm and pull to the future with a vision and a plan using our assets and our talents collectively. We give thanks to our extremely dedicated and hard working Chamber of Commerce for its tireless commitment to education, leadership development, voice, principles, and quality of place. Like the Mayflower, the plan, the tools, the supplies were all on board, but the encounter was unpredictable and only manageable due to the preparation of seasoned leadership and volunteerism. The Chamber of Commerce and CEO Council provide this support to the community in spades and develop servant leaders into the community. As mentioned earlier, Thanksgiving is two parts: Thanks and Giving. And giving requires of us leadership. This Thanksgiving we are reminded that our community benefits when we, as citizens, invest our time and talent in the community. We give thanks to our community leaders, current and past, and remind ourselves to continue to be giving. John C. Maxwell, a renowned writer on Leadership Development, considers one of the most important driving forces in today’s economy to be the development of servant leadership skills that can gain consensus, build momentum, incorporate all ideas, and execute with focused energy. The best leader, Level 5, represents a leader that has spent their entire life developing people and organizations that people follow just because of who he or she is or what they represent. They are giving of themselves to people and their community. Think Billy Graham, Martin Luther King, Thomas Edison, Warren Buffett. Becoming a great servant leader is a life-long investment in yourself. What matters most is not what you do day by day, but throughout your lifetime. As we give thanks to our past accomplishments, it is equally important to continue giving of ourselves to community growth. As we challenge ourselves I want to leave you with a few notions for consideration. Our new colony is no longer another continent for us to sail and encounter. 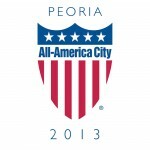 Our new colony is our Greater Peoria Region. Our challenge is reminding ourselves consistently that our new colony is the differentiation of our region to the global market. No one remembers great suburbs. They remember great regions. Our challenge is to tell the story of the region so we attract new settlers and, as necessary, rebuild with vision and determination. In partnership with the Chamber, CEO Council, and FFCI, we need to capture this visual and share the same with our potential settlers as we develop our leading assets in the medical field, manufacturing, higher education, our warehouse and downtown development, our rich assets of agriculture, water, wind, and transportation. And being the World Headquarters for such a tremendous company as Caterpillar, we need to demonstrate to our global neighbors that our region is the place to do business. We should galvanize as leaders as one region that needs to be projected to the global market place as the land of opportunity, rich in assets and resources. Then as we tell our story to potential settlers, we must give to ourselves. I am going to work them after school with meaningful work, teach them communication skills, teach them customer service skills, and generally excite them into a world that is not in their wheel house right now. We would be giving to ourselves the future work force, the way that many of us started through good ole OJT or sometimes compliments of Uncle Sam. In WWII, the Uncle Sam poster telling us that “I need you” is famous and lasting. The times might be different, but our communities now need each of you! It brings to mind Theodore Roosevelt and his address on being a citizen in a republic. To paraphrase Roosevelt, “the credit belongs to the person who is actually in the arena, whose face is marred by dust and sweat.” The I-pod, the I-pad, and the I-phone are remarkable and may help build communities, but they alone are not enough to be a citizen. Uncle Sam telling us that the Country needs you is as relevant today as at any time in history. One of the most rewarding developments that I see in this community is our highly engaged young leadership organizations. From the Chamber’s Young Professional Organization, Community Leadership Schools, EPIC, and Our Gen U program through the Heart of Illinois United Way, our community gathers young professionals and networks their skills into service. To our seasoned business leaders, give of your time to teach and mentor, good ole OJT. To our young professionals, give of your time to learn, be challenged, and challenge conventional wisdom. With sustained leadership giving to one another and our community, our region will have a similar scorecard. This Thanksgiving, celebrate with your families. Take a day of rest. Continue to be thankful. And continue to give of your time and leadership to our region. Support the Chamber of Commerce, the CEO Council and our local businesses. Remember that the United Way and the Red Cross are in need of your support as we heal and grow for the future. Recall that the Pilgrims needed help; they needed to be innovative and looked to one another for support. The Country did the same with Uncle Sam in WWII. Our community needs that same energy and focus as we build our new colony in the Urban Core - we are rich in assets; let’s invest together.